The WSF President met Jacques Rogge this week in Lausanne before presenting the case for squash's inclusion in the 2016 Games. With next year's vote on Olympic inclusion approaching rapidly, it is reassuring to see that steps are being made by squash's top administrators to promote the sport's best virtures at the highest level. But how did the presentation go down? And what are squash's rivals up to? 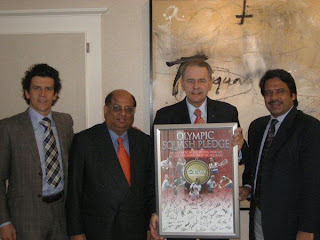 Outgoing WSF President Jahangir Khan introduced his successor, Mr N Ramachandran, who was elected at last month's WSF AGM which was held during the World Championships in Manchester. The WSF delegation took the opportunity to present a commitment signed by top squash stars, led by world number ones Nicol David (Malaysia) and Amr Shabana (Egypt), pledging that the Olympics would be the ultimate prize for any squash player. 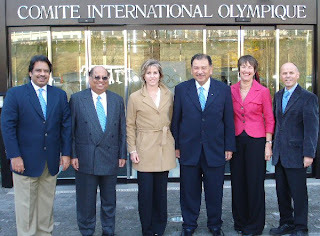 The much-anticipated pitch to the IOC that followed was headed by IOC member Tunku Imran, Susie Simcock and Jahangir Khan, along with N Ramachandran. Sarah Fitz-Gerald and WSF Technical Director Andrew Shelley completed the group. - Squash is a sport for our time: A sport giving great competitive exercise in a short time period, which has strong national federations and features development initiatives all the way from local level to elite. - The sport is already featured in every major international multi-sport Games, except for the Olympics. - It has uniform scoring. - Competing in the Olympics would be the pinnacle of the career of any squash player. - The sport has had world champions from all regions, as well as around 150 national federations belonging to the world body. I have yet to read any reaction to the presentation - details here when I get them. The PowerPoint slides that accompanied the presentation can be viewed here. One of squash's rivals for inclusion in the Games - rugby sevens - has produced a promotional video with a host of stars for its pitch. Click here to watch. Another big rival - golf - has also produced a series of videos with stars such as Vijay Singh and Ernie Els endorsing the bid. Watch it here. SquashBlogger you really took a disappointingly soft approach on this topic. "The blog postings that I write are to stimulate debate, and by providing opinion rather than solely news-based articles I hope to provoke readers into suggesting how squash might tackle some of the issues mentioned above." Thanks for your comment. You make a fair point. I agree that I haven't particularly expressed my own opinion in this post. The reason for this was two-fold: I needed to get *something* on the site quickly to show that the presentation had been made (as the Olympic vote is something I have followed closely), and secondly, at the time of writing I was only party to the WSF press release and not in possession of any first-hand insights into the quality of the presentation (other than the PowerPoint) or what the general reaction was. I am well aware of what the behind-the-scenes situation was in the build-up to the presentation, and agree with many of Shawn's (Squash 360's) sentiments (see my other posts tagged 'Olympics'). I certainly have some opinions about what I have seen so far, but I also want to gauge others' reactions to the material available (the Exec. Statement, PowerPoint etc. ), and particularly how the efforts of rugby, golf etc. might be seen in comparision. I am also looking out for reactions to the presentation from those that were there. I really appreciate your comment: I believe that the quality of squash journalism is comparatively poor, and that comments like yours are essential if we are too improve the coverage of squash in the media, which in turn will put more pressure on the administrators of the game to raise theirs. What do you think? What do others think? Sadly, I feel the lack of response to your original item and the single reply is a sign of the apathy that exists within squash. Many, anecdotally the majority, players are only concerned with their own needs in terms of playing and are incredibly insular to the greater needs of the sport. I see it at all levels from clubs, through counties etc. I read somewhere that the fact that all the administrators are doing ok for themselves, especially within the PSA that maybe, just maybe, they are part of the problem in as much as there could be the old "turkeys voting for Christmas" scenario as far as grasping the radical change required within the sport to push it on. Who knows? Great to see that people prefer a violent sport like rugby rather than squash. Another choice would have astonish me. yes tell me that rugby is for gentlemen..
haha gentlemen who create a sport where it is almost authorize to fight. squash do not need to be olympic. squashblog poll: a little bit of everything?